Q. What is Gee Funding? Q. How much does it cost to join GeeFunding? As issuer or investor, you do not pay any money to join Gee Funding. It’s Free to Join! We charge 7% Gee Funding platform fee to the issuer on fully funded raise. WePay payment processing fees also apply and are payable directly to the service providers upon the completion of the funding campaign by the issuer. We do not charge investor any amount when investing on any of the investment opportunities found on our platform. Read more about our fee. Q. How Do I Create Funding Campaign? To start raising funds. All you must do is SIGNUP/LOGIN, create your company profile by following the simple process, and make sure all info pertain to your account are entered accurately. Gee Funding platform funding option is preset at FIXED. Fixed or inelastic funding enable the issuer received funds only when the raise is successful, and you were able to reach your target goal. However, when the funding target goal is not reached and unsuccessful, then the unsuccessful amount generated is returned to the investors without deduction of fees. Ensure you have uploaded your personal photo, your business details, the funding campaign details, image or video, and the deal documents. We require issuer to upload their deal documents. Before submitting the funding campaign for review/approval, make sure you have clicked on the SHOW ME WHAT LEFT TO DO to ensure you’ve completed all things required of you. Or SAVE the draft to enable you return and complete later. When you’re ready to submit the campaign for Gee Funding review/approval. Click SUBMIT. Q. How Do I Become an Accredited Investor? Gee Funding offer its portal members Investor Accreditation, including investor verification document accessible from the individual investor profile page. The Investor 'Acknowledgement' and 'Investors Verification' document in .pdf file are available for download at the Investor account dashboard. The individual investor shall execute both the Investor Acknowledgement and Investor Verification document, and re-upload the document back to the platform for approval prior to participating as accredited investor in the investment opportunity offerings listed here at Gee funding. Q. What Is Money Laundering? Money Laundering is the process by which a criminal conceals the existence, source or nature of illegally derived funds to make them appear legitimate. Money laundering typically occurs in three stages: placement, layering and integration. Crowdfunding platform companies and other financial institution are at any point in the process susceptible to being used by criminals to carry out money laundering activities. Placement is the initial placement of illegal funds into the financial system, normally in the form of currency or cash equivalents (money orders, traveler’s checks, and bank drafts.) Placement can occur when accepting a new account and the initial premium/deposit, subsequent payments and deposits, or third-party receipts. Layering is the hiding or distancing of the illegal funds from their source by creating transactions or a series of complex transactions. Some ways layering can occur include processing multiple and frequent account transfers, ownership changes, or address changes. Integration is the ultimate disbursing of the “clean” proceeds back into society. At this point, the funds are likely to appear legitimate and are disbursed from a legitimate source. Criminals often employ sophisticated methods of disguising the proceeds of their crimes, just as terrorists seek to funnel the proceeds of ostensibly legitimate businesses to fund and execute terrorist plots. Terrorists and other criminals are increasingly using the facilities of securities firms and crowdfunding companies to conceal the source of their funds. The concept of money laundering can also include the activities of individuals and businesses seeking to conceal their earnings from the Internal Revenue Service and state and local taxing authorities. READ MORE About Anti-Money Laundering! Q. What is Equity Crowdfunding? Equity crowdfunding is the type of crowdfunding with which Title III of the JOBS Act is primarily concerned. With this type of investment, multiple investors pool money into a specific startup in exchange for equity shares. This kind of crowdfunding is most often used by early-stage companies to raise seed funding. Equity crowdfunding is not the same as donation-based crowdfunding or rewards-based crowdfunding which gives perk rewards to donors for just-cause, charitable, or religious donations those are not applicable to investments as equity. Equity investments may be attractive to non-accredited investors for a couple of reasons. First, there’s the potential for a solid return if the startup you’re investing in eventually has a successful IPO. Once the company goes public, you can then sell your equity shares and recover your initial investment, along with any profits. If you happen to luck out and invest in a startup that ends up being the next Google, the payoff could be huge. The two biggest drawbacks associated with equity investments are their inherent risk and the timeframe. There’s no guarantee a new startup will succeed, and if the company fails, your equity shares would be worthless. If the company does take off, it may be years before you can sell your shares. Data from CrunchBase has shown that the average time to go public is 8.25 years, which is something you would need to factor into your exit strategy. Q. What is SAFE Equity? A SAFE is an agreement that grants the holder the right to equity at a later date, typically when venture capitalists lead a 'Series A' financing. SAFE is a short, 5-page investment document that is intended to be simple to understand and convenient to administer. It’s not a debt instrument but rather investments via SAFE show up on the company’s capitalization table (cap table) like other convertible securities (ie – warrants, options). SAFE provides investors the opportunity to convert their investment to equity at a point in the future when a Preferred round equity funding is raised. SAFE has many similar features to the well-established convertible notes, such as provisions for early exit (change of control), economic benefits such as the Discount and protection features such as the Valuation Caps. But one thing SAFE doesn’t have is a maturity date (remember, it’s not a debt instrument), so there is a possibility that it never converts to equity and there’s nothing in the terms that call for the investment to be repaid to the investor. SAFE Advantages: The lack of a Term (maturity date) gives lots of flexibility. The lack of an Interest Rate saves you a little equity dilution in the future when the SAFE converts. 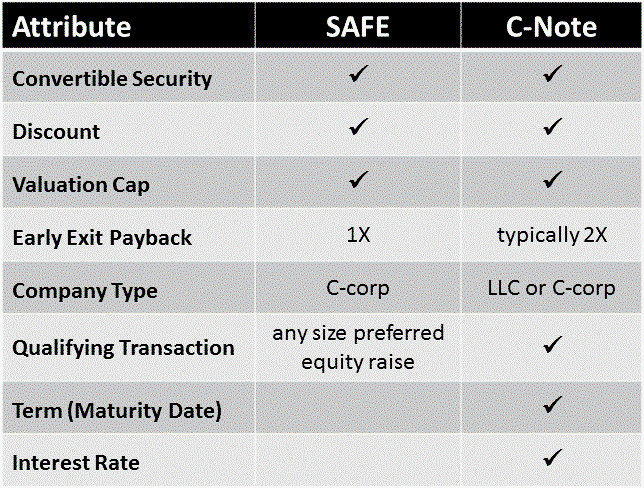 SAFE Disadvantages: You will need to be incorporated as a C-corp.
C-Note Advantages: LLC’s can use it. C-Note Disadvantages: If you reach the Maturity Date, you’ll either need to request an extension from your investors or somehow close out the Note (payout of principal + interest or convert to equity anyway). The interest that accrues until an equity conversion means slightly more dilution for you and other shareholders. SAFE Advantages: The option to convert to equity if the startup gets acquired (change of control) before a natural conversion (although some C-notes also have this feature). No Qualifying Transaction hurdle to get in the way of an equity conversion. SAFE Disadvantages: No Term (maturity date) means no forcing function based on time elapsed. No interest accrual. C-Note Advantages: Has a stated Term (maturity) date that helps force some discussion/action in the future. Offers interest accrual to enhance the potential investment returns. Most offer a 2X return of principal if there’s an early acquisition. C-Note Disadvantages: If the Qualifying Transaction term is set too high, the startup could raise a smaller equity round of financing and the Note doesn’t automatically convert to equity. Q. What is Convertible Note? The difference between SAFE and a Convertible Note. Q. What is Revenue Share or Profit Share? Q. What is Promissory Note? The GeeFunding Promissory Note is good for debt fundraises that don't require much complexity. It can be powerful for crowdfunding when combined with the Investor Perk Agreement. It may also be paid back by the company at any time. Q. What is Debt Crowdfunding? Q. What is the minimal investment amount I can raise with Gee Funding? Gee Funding platform has $10,000 preset minimal investment amount. Meaning you cannot raise fund below $10,000 our system will not allow it. Also, the platform has a preset maximum amount of $1,070,000. Our system will not allow you raise money over $1,07M. Q. What happened to my money when I Invest? When you invest, your investment fund is transferred to an escrow account. Gee Funding is prohibited by SEC and FINRA regulation from touching or holding your money. Regulation funding portal cannot hold funds. All investments are placed in a third-party escrow account service provider. Funds are transferred to the business owner or issuer only after the fundraising target has been met or closed. And all fees related to our service are then payable to Gee Funding, Inc., through our third-party escrow provider after the fully funded or partially funded campaign closed. However, if the funding campaign is unsuccessful, your investment will be refunded to you. Q. How and What Can Issuers Advertise? Regulation Crowdfunding campaign is very different from conducting a rewards-based campaign, in (Reg. CF) the SEC and FINRA are very strict when it comes to you talking about your fund raising. The SEC is very clear that you cannot make any reference or any indication, posts or public references of the offering until it is live. While you can continue normal advertisement of your company or service, the SEC deems any public posts or communication about the offering to be a direct violation of the regulation. A statement that the issuer is conducting a Reg CF offering. The terms of the offering, which is defined as the amount, the nature, and the price of the securities offered and the closing date. Factual business information about the issuer which is limited to the name, address, phone number, and website of the issuer if any; as well as an email address of a representative of the issuer and a brief description of the business. Also, issuer cannot say or indicate on their advertisement that FINRA or SEC has approved or endorsed the specified funding campaign. That is a no, no. As long as an issuer sticks to the points mentioned above, they can essentially broadcast their offering anywhere on the internet. Read more about the Rules Governing Advertising and General Solicitation in our Policy page. Q. What information will an issuer provide an investor? Q. What is Gee Funding due diligence process? As a platform registered by Security Exchange Commission and a pending member of the Financial Industry Regulatory Authority, we review and approve every pitch on the Gee Funding portal to ensure that all the information presented to the crowd is fair, clear and not misleading. We conduct thorough due diligence on the issuer, its legal structure and directors by vetting the info their submitted to our platform and by using third-party provider service as well. We also verify evidence supporting any claims being made by the business such as market size, contracts and partnerships to ensure the information provided is accurate. This process can take between days or weeks, sometimes longer if the company or raise is complicated. To make this process more open and transparent to our members, our Due Diligence Charter outlines in detail the analysis and verification that is conducted by the Gee Funding team as part of the approval process. It is also regularly updated when we make improvements to our due diligence processes. Q. Do you recommend connecting with Facebook? Yes, we do! It's a simple way for anyone to log in to GeeFunding.com. If you're an entreprenuer, it's a great way to let investors know more about your business and your fund raising campaign. It's an easy way to show potential investors that you're a real person. You may also edit the privacy settings of your Facebook account to control what your guests see.